USA 2019. dir. M. Night Shyamalan. 129 mins. Starring James McAvoy, Bruce Willis, and Samuel L. Jackson as the three superheroes, this film questions whether we as humans are capable of superpowers. 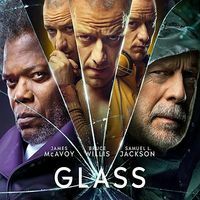 In this film, security guard David Dunn (Bruce Willis) uses his supernatural abilities to track Kevin Wendell Crumb (James McAvoy), a disturbed man who has twenty-four personalities. They are eventually caught and put in an institution for the criminally insane. Meanwhile, Elijah Price / Mr. Glass (Samuel L. Jackson), a superhumanly intelligent mass murderer and comic book theorist, is David's sworn arch enemy. He has been in the institution for 18 years. What interested me in this film is the insight of how humans are only using a small part of their abilities in life when in fact we are all capable of doing more and reaching deep into our abilities to become superhuman. That seems to be the basic theme of many of Shyamalan´s films. The ending is interesting and gives the viewer food for thought of the possibilities of being superhuman, whuch many humans already have, such as ESP and other gifts that are within us waiting to come out.